« Ice Carvers from China Create Gaylord National’s ICE! featuring How the Grinch Stole Christmas! The Berkshires: Norman Rockwell's studio in Stockbridge, in the Berkshires, one of the attractions that can be visited during a stay at historic Rock Hall © 2010 Karen Rubin/news-photos-features.com. The weeks leading up to Christmas can be stressful, so Rock Hall Luxe Lodging, an historic luxury property located in the bucolic Litchfield Hills/Southern Berkshires, has created a pre-Christmas package, valid through December 23rd, that enables guests to prepare for the holiday season while also enjoying some rest and relaxation. The pre-holiday package includes a VIP Coupon Book for the Lee Premium Outlets in Lee, MA (located 25 miles away) where guests can find a wide array of gifts for friends and family, as well as treats for themselves. Guests also receive a certificate for a complimentary cut-your-own Christmas Tree at nearby Up Country Farms, which offers a selection of Blue Spruce, Balsam and Frazier Firs ranging from four to 12 feet. In addition, guests can enjoy a Rock Hall Signature Massage (one per guest). Those participating in the package will also enjoy a 10 percent discount on items in the Rock Hall boutique, which features unique gift items from across the globe. Guests staying at Rock Hall over the eight nights of Hanukah (December 1 – 8) will enjoy complimentary homemade latkes (potato pancakes) each evening along with a traditional candle lighting and a gift bag filled with chocolate coins. Rock Hall, which is listed in the the National Register of Historic Places, offers five luxurious guests suites featuring fireplaces, Wi-Fi, imported linens, down bedding, and flat screen TVs. The property also features screening, fitness billiard and game rooms, as well as marked hiking trails. Local activities include alpine and cross-country skiing, antiquing, music, theatre, dance, film, outlet shopping and more. On-site massage and private yoga, training and Pilates classes can be arranged with advance notice, as well as a horse-drawn antique carriage or sleigh-ride with door-to-door pick-up and drop-off. Addison Mizner built Rock Hall, a 10,000 square foot manor house, in 1912 for Jerome Alexandre, of the Alexandre Steam Ship Lines fortune. The property’s grounds are attributed to a collaboration between the firm of Olmsted and Olmsted and Mizner with an impressive variety of specimen trees, perennial gardens and a wildflower meadow. This historic gem has been meticulously restored and is now one of the areas most luxurious and romantic lodging options, featuring in-season use of a 75’ heated outdoor swimming pool and Jacuzzi, and a synthetic grass tennis court with ball machine. The Pre-Holiday package starts at $550 per room per night midweek (for two guests) and includes the coupon book, tree and massage for each guest. Cost for the Mizner Suite and Penthouse Suite is $625 per room per night. Each weekend night cost is an additional $25 per room per night. Additional guests may stay in the room (without complimentary massage or soak) for $75 per person. All guests must be over age 12. Rock Hall is located two hours north of Manhattan in the northwest corner of Litchfield County, Connecticut in the Litchfield Hills and Southern Berkshires. 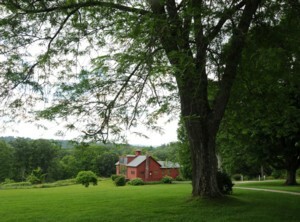 It is 30 miles west of Hartford (location of the Mark Twain House, Wadsworth Atheneum and The Bushnell), 30 miles from Lenox, Massachusetts (location of the Tanglewood Music Festival), 35 miles from Becket, Massachusetts (location of the Jacob’s Pillow Festival) 14 miles from Torrington, Connecticut (location of The Warner Theater), 19 miles from Lakeville, Connecticut (location of Lime Rock Park and the Skip Barber Racing School), 3.5 miles from Norfolk, Connecticut (location of the Norfolk Chamber Music Festival and Infinity Hall) and 25 miles from the Lee, MA Premium Outlets. For more information and reservations, go to: www.19rockhallroad.com, or email: info@19rockhallroad.com. This entry was posted on November 4, 2010 at 3:29 pm and is filed under Berkshires, Connecticut, historic hotels, holiday travel, travel deals. You can follow any responses to this entry through the RSS 2.0 feed. You can leave a response, or trackback from your own site.